David Deen is kind of a hippie. 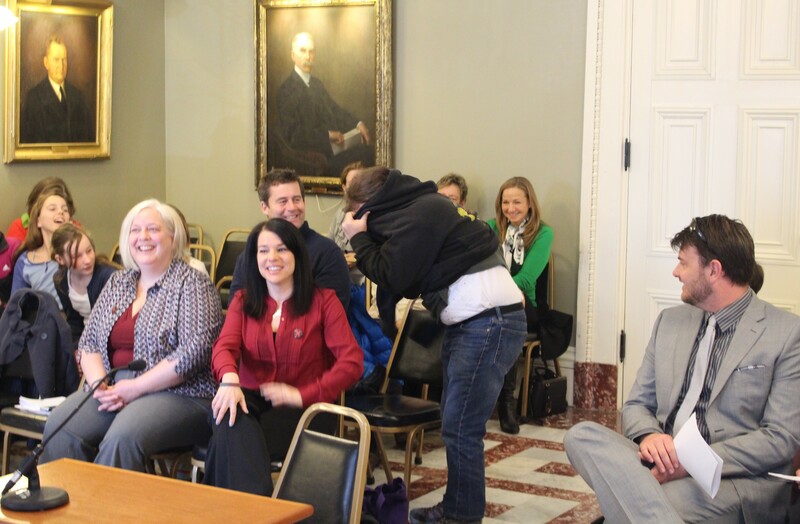 The Democratic state rep from Westminster West wears Birkenstocks to the Vermont Statehouse. His day job, as a river steward for the Connecticut River Watershed Council, presumably involves a lot of canoeing and fishing. Heck, the guy even chairs the House Committee on Fish, Wildlife and Water Resources. But the dude does not listen to Phish. "Nope, I never have," he said. "I know they've been around. You hear about their concerts and other stuff, so I know what they are. But no, I'm not a fan, particularly." So when the band's drummer, Jon Fishman, asked to testify before Deen's committee this week, he recalled, "I had no idea who he was." 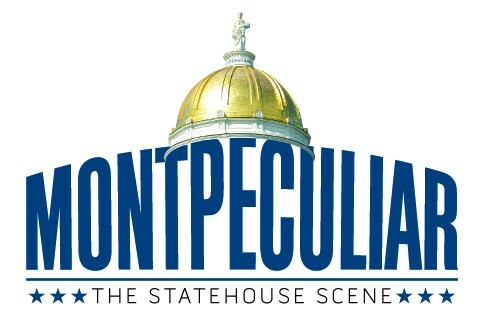 Nor, it seemed, did the panel's other bearded bros, who looked nonplussed Wednesday morning when the 50-year-old Charlotte resident rose to speak in a first-floor Statehouse hearing room. 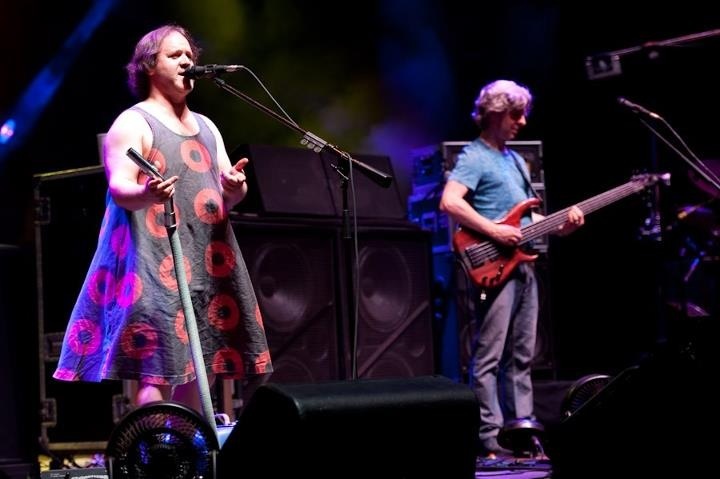 Fishman, who typically wears a doughnut-patterned muumuu on-stage, apologized for his appearance. "I didn't know I was speaking next," he said as he pulled off a black hoodie, revealing a slightly more formal green sweater. "This is as well-dressed as I can be." Jon Fishman removes his hoodie. 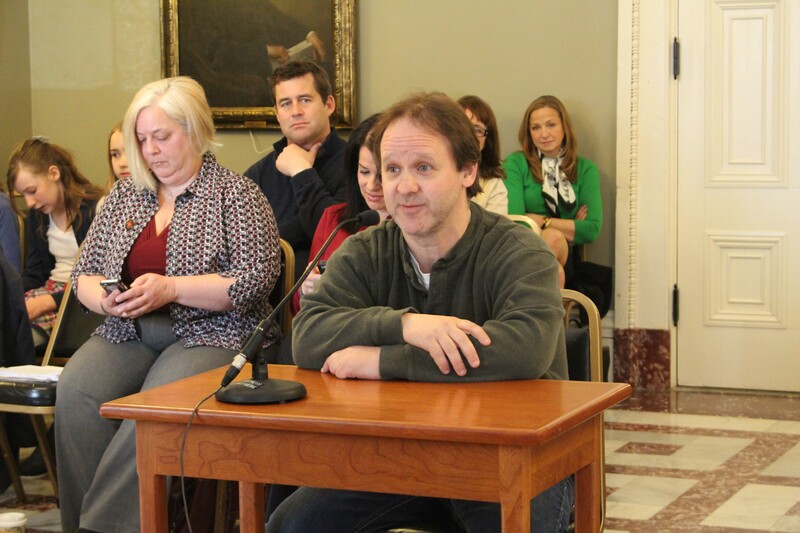 Upon taking his seat in the witness chair, Fishman proceeded to testify on ... elephants. 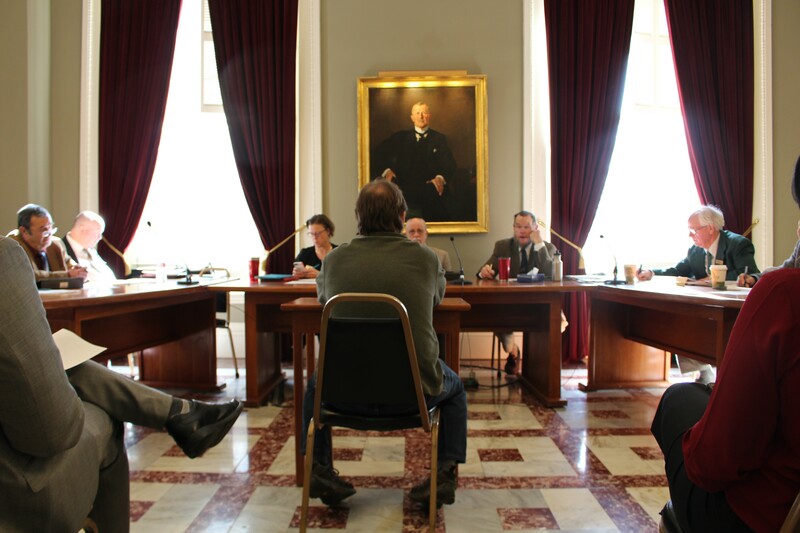 Specifically, the vacuum virtuoso urged the committee to ban the sale and trade of their tusks — and those of other large mammals — within Vermont's borders. "I understand that a big concern for the inconveniences that a ban on ivory would cause humans is the effect it might have on traveling musicians," he said. "I just can't begin to tell you how crazy and absurd I think that is." Having spent 32 years on the road, Fishman said, "I can't imagine that there's a piano player out there that, given the choice between extinction of elephants from this Earth and their ability to have ivory on their piano keys, would adhere to insisting that they have ivory on their piano keys." Calling the question of whether to ban ivory sales a "no-brainer," he posited that it was "mildly insane that we're even having a conversation about whether or not to support a law which would either ensure elephants continue to be here, or not." What prompted Fishman's newfound passion for the elephantidae family? Why, his own family. 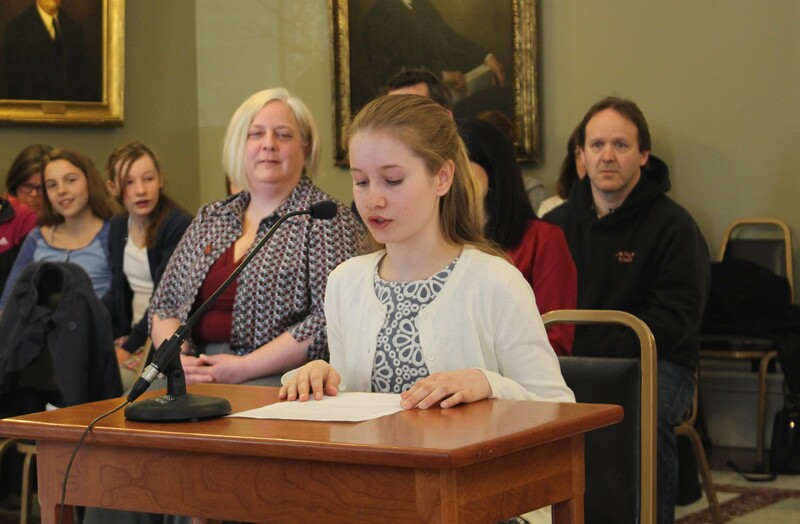 Two of Fishman's five children attend Shelburne's Endeavor Middle School, which adopted the ivory ban legislation, H. 297, as a pet project. Two dozen of the school's students and teachers joined the famous parent for Wednesday's hearing. And one of them, sixth-grader Taegen Yardley, quite clearly stole the show from Fishman. "Human beings can learn a lot," Yardley told the committee when it was her turn to testify. "Elephants are very smart creatures, and they care about everybody and everything, and now that humans are becoming threats to them, it's harder for them to be friends with humans." Not everyone in the room was as blasé as Deen about the guest in their midst. A reporter for Seven Days could not restrain his fanboy tendencies as he attempted to interview Fishman after the hearing. "My first question is kind of hard-hitting," the reporter began. "I'm wondering why you're such an awesome drummer." "I've been playing for 42 years," Fishman responded. "If I haven't gotten somewhere on the instrument by now — I don't know that I'm an awesome drummer. I know that I've been doing it for 42 years. After 42 years, you get halfway decent, at least. So I'm probably halfway decent." "I would say more than halfway decent," the reporter gushed, shredding any remaining threads of journalistic objectivity and professionalism. "I don't think I've been doing anything else other than breathing that long," the drummer said. "So I mean—"
Given Phish's relatively apolitical history, the reporter wondered, why had Fishman chosen to speak out so publicly about the plight of elephants? "When you're a parent, it's kind of like you gotta put your money where your mouth is," he said. "I can't tell [my children] that they should support something or that they should be mindful of their activities in the world if they ask me to participate in something and I'm not willing to participate." Over the years, Fishman said, "The band has had long and very passionate discussions about the degree to which we get involved in social and political issues. And from our own personal experience of seeing a lot of entertainers sort of get up and shoot their mouth off about things they don't necessarily [know about]." Of Phish's four members, Fishman said he was often the "most involved" and "worked up" about political issues, but wasn't always able to convince his bandmates to take collective action. "I have tended to be the loser in that argument. I've been the one in the band that tends to say, 'We should use our bully pulpit!' and I get shut down," he said. "We do have a measure of democracy in the band, and I do see where 'art for the sake of art' comes from." 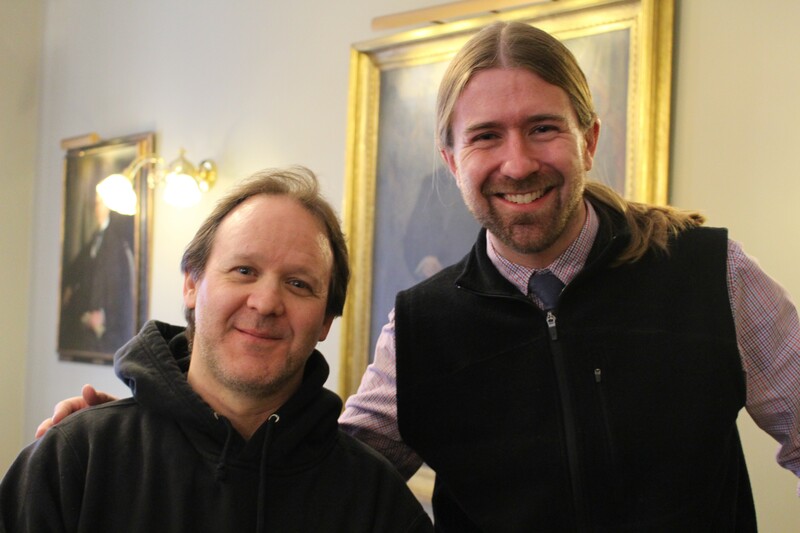 Phish had one "really awful experience" in political activism, Fishman recounted, when it played a Voters for Choice benefit concert in Lowell, Mass., in May 1995. Though all four band members consider themselves pro-choice, he said, they regretted playing the benefit after hearing Gloria Steinem speak following their set. "I agree with a lot of what she says. I disagree with a lot of what she says, too. And I didn't know that until she was speaking right after we played for this thing for which she was the lead speaker," he said. "So suddenly we are married to her opinions." Some Phish fans reacted negatively and made that clear in letters to the band. One letter had a pretty significant impact on Fishman, who was adopted at an early age. "I'm an adopted kid, OK? So someone on Earth didn't have an abortion, and I'm here talking to you today. Alright?" he said. "Now, another person who was adopted wrote a letter in expressing the same sort of thing. So, now, that to me, there's some sound reasoning that I hadn't thought about — and suddenly we're involved in this very divisive social issue." Elephants, though, are a little different, he argued. "That's not a politically human-driven issue. This is, like, our survival," he said. "To me, if we're talking about the preservation of life on earth and our own well-being, that's less politically charged." For what it's worth, that Lowell concert was pretty dope. Phish debuted several modern classics, such as "Free" and "Theme From the Bottom," and some excellent rarities, such as "Ha Ha Ha," "Glide II" and "Spock's Brain." After disposing of the political issues, Seven Days got down to serious business — namely, asking about Phish. Fishman said he'd been in the studio recently and barely missed connecting with pianist Page McConnell, who arrived a couple days later. What were they working on in the studio? "Top-secret things," the drummer said. "Nah, just, you know, songwriting." "Yeah, I was doing some stuff with [guitarist Trey Anastasio], doing a little demo-ing," he said. "We're always working on something." Could he reveal any surprises about Magnaball, Phish's 10th multi-day festival, which is set to take place in August in Watkins Glen, N.Y.? "Oh, no," he said. "I can reveal nothing. And I wouldn't." At that point, the reporter swallowed his pride and asked for a photo.